Not sure what to do with your bananas that are turning leopard spotted. You can make these delicious and sweet crepes. Defrost the bananas and place in a high speed blender along with the rest of the ingredients. Blend until there are no more lumps. On a dehydrator paraflex, scoop a 1/4 cup of the crepe recipe for each crepe. Using a spacula, shape the crepe into a circle that is approximately 1/4 inch thick. You will fit 4 crepes on each dehydrator sheet. I made 20 crepes with this recipe. Dehydrate at 115 degrees for approximately 12 hours. You will know that they are finished when you can carefully lift the crepe right off the sheet without creating any holes. It will resemble a rubbery fruit roll-up texture. You can fill your crepes with any fruit. I like to fill them with Mimi Kirk’s cashew cream cheese, and a 1/4 cup of blueberries. Then top the crepes with a sprinkle of cinnamon. I also like to freeze the crepe for a couple of hours to make an ice-cream treat!!! 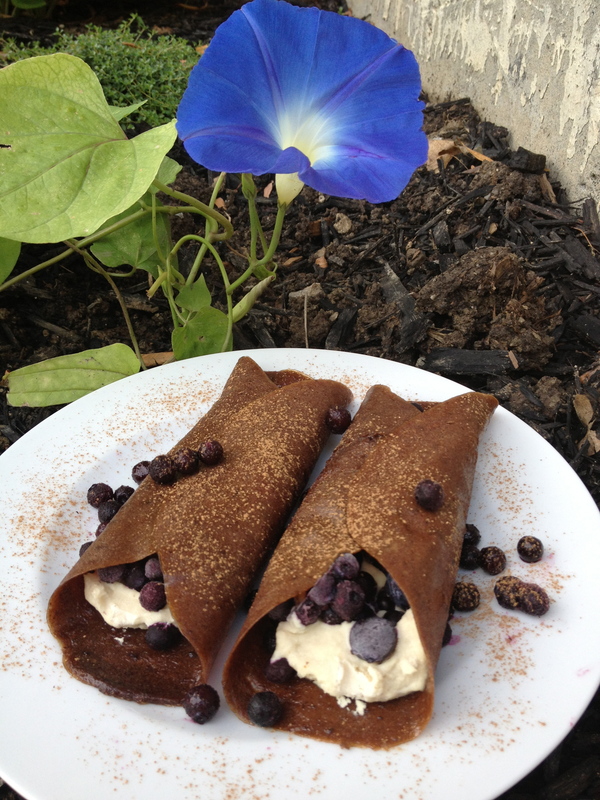 This entry was posted in Desserts, Uncategorized and tagged banana, blueberries, cacao, cashew cream, chocolate, crepes. Bookmark the permalink.